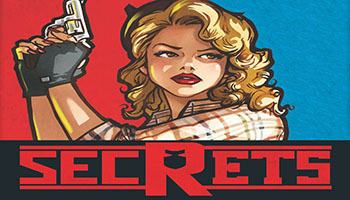 In Secrets, the second co-design between Eric Lang and Bruno Faidutti, players are assigned a hidden team - the CIA or KGB - and are trying to collect the most points for their side. In addition, one or two players are secretly anti-establishment Hippies who are working for nobody. Their goal is to fight the Man and have the fewest points. On your turn, offer one of two randomly drawn agent cards to another player. These cards are worth points and have varying good or bad abilities. That player either accepts the agent, in which case they score it, or they refuse, in which case the card returns to you, and you score it. The game ends when a player has five cards, after which the teams are revealed; the team with the highest combined score wins, unless a Hippie has the single lowest score, in which case they win. Secrets is a secret identity game. The action takes place in the 1960s. Players are either members of the CIA or KGB, or Hippies. Team affiliations can sometimes change during the game and must always be kept secret. At the end of the game, the team (CIA or KGB) with the highest score wins, unless a Hippie managed to have the lowest individual score and seize the victory for themself.